George Cody step down from his position as registrar of voters at the end of his term. NEW CANAAN — George Cody grew up in politics. 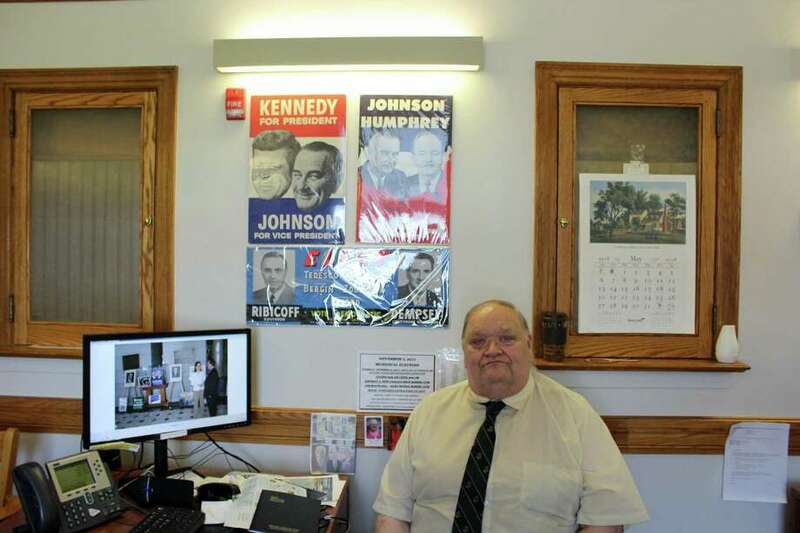 Posters of former presidents, campaign slogans and magazine covers adorn the walls of his registrar of voters office on the first floor of town hall. The 72-year-old and third generation New Canaan resident has been the town’s Democratic registrar of voters since 1994. He recently announced his decision to step down at the end of his term in January. Q: What was the most challenging thing in your position these past 24 years? A: The biggest challenge was keeping up with new regulations and new laws. It’s an ever-increasing change and it was one of my considerations when I chose to retire. I’m set in the ways of 1990s, and I want to give a new group an opportunity to bring the election management into the 21st century. I’m doing things I’ve done that I inherited in the 1990s. Now I have a new crew coming in who will set up the office and the elections — it’s healthy to update the registrars and the system. Q: How did you begin collecting posters, buttons and magazines? A: Our family has been active in the Democratic Party for many years going back to the 1920s and 1930s. My grandfather was the registrar of voters for the Democrats from 1917 to 1947. It wasn’t as difficult then — the 1908 list of all the Democrats in New Canaan was in two columns. My father ran the Democratic headquarters for many years, and as kids we would always clean up the headquarters and ended up with all these posters. And I basically resurrected a lot of them so that they’d be part of a real collection. I started (collecting buttons) in 1960 when I was 12 years old when I was appointed manager of Kennedy-Dixon mock election at Saxe Middle School. Then I went to the Democratic convention in Atlantic City in 1964 and got all the (Lyndon B.) Johnson pins, and from that point on collected the Democratic pins and that’s where the collection really started. Q: What are some of the changes you’ve seen throughout your tenure? A: When I became registrar, there was little coordination across the state. They basically ran elections as they interpreted state law. Then they passed the Motor Voter Act and the secretary of the state became more and more involved in coordinating activity and function and it was a slow process. When I started, there was little interference from Hartford. We had to do it within the law and were usually left alone. But now they have introduced so many new regulations and law on management of elections and a certification program whereby every registrar has to take courses from UConn through state-approved courses, a two-year program training and maintain the certification while a registrar and travel to Hartford for additional training. The other changes that were critical was communication, and I really wanted to improve that. When I came in there was no communication — no internet, no email. And the town, if they had email, they did not extend it to the registrars because it was not full time or valuable enough. The first thing I did was call around, and it took me six months to get everyone’s contact information. They would always ask me to send things to all the registrars in the state. Q: Will you continue in politics after you retire? I’ll stay actively politically, I just won’t have the commitment to actually being here. I became involved with the state voter registration association and I got on the legislative committee, which I really wanted to do. One of the reasons I became registrar was that my ultimate desire, which was never going to be fulfilled in New Canaan, was to work up in Hartford in the state Legislature, and as a Democrat in New Canaan that wasn’t going to happen. I always wanted to be in politics and government. I ran in 1984 knowing I couldn’t win (a spot in the General Assembly) but then I moved on to be registrar in 1994. I got involved in legislation and we worked on election laws and many, many changes on the job. I got working on legislation and the leaders of the election committee and the secretary of the state office. Moving out of New Canaan was not going to happen. I like to say I was born a block from where my father was born and where his father was born.